A social media storm erupted on Sunday when two girls were stopped from boarding a United Airlines flight because they were wearing leggings. The girls were flying as guests of employees, and thus were subject to the company's dress code. But it is not the first time leggings or yoga pants have caused controversy in the United States. Both types of tight-fitting trousers, which have become increasingly popular leisure wear, have become the topic of hot debate in recent years. For many, they are simply a comfy alternative to jeans. For others, their form-hugging material makes them overly revealing or even obscene. Last October, a man in the US state of Rhode Island sent a letter to his local newspaper, calling for women over 20 to stop wearing them. "Like the mini-skirt, yoga pants can be adorable on children and young women who have the benefit of nature's blessing of youth. However, on mature, adult women there is something bizarre and disturbing about the appearance they make in public," wrote Alan Sorrentino. It sparked a "yoga pants protest". 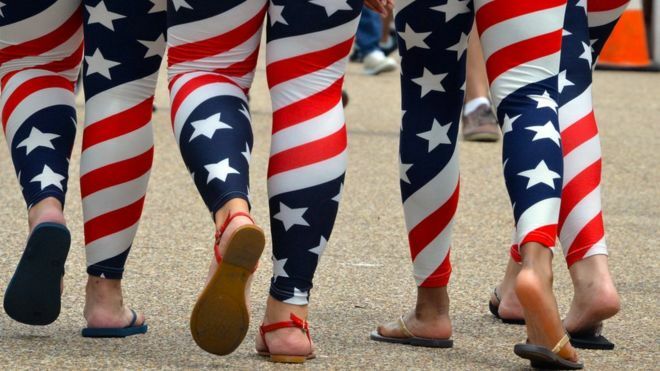 Hundreds of women of all ages responded by walking through the town of Barrington wearing leggings. Jamie Bee, one of the protest's organisers, told the BBC the outrage was never really about yoga pants. "For me and many others, it's the principle," she said. "Why do people feel the need to tell others how to dress?" Mr Sorrentino, who said he received threats after the backlash, later said his letter was meant as satire. But across the world, some women are fighting back against restrictions on what they can wear, from burkinis to comfortable footwear.